When I was checking my blog, I only posted desserts or appetizers. Where is the main dish? So I will decide to post some main dishes now. Then I think what the recipe will be, may be some authentic fish recipe. It is not actually main dish but very authentic Bangladeshi dish. 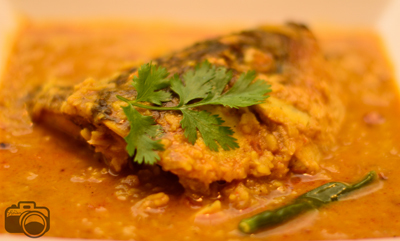 It is a spicy dish moong lentil cooked with Rohu/Rui fish head. I am going to share my mother’s recipe for the first time. There is no chance to get wrong because she has 35 years experience of cooking. 1. First roast moong dal on slow heat until lentil is crisp. But be careful we don’t want to burn it. And soak in water 15 minutes. Then drain the water. 2. Clean the head properly. If possible cut into pieces otherwise keep it whole. It will break into pieces after cooking. 3. Take 1 teaspoon salt and ¼ teaspoon turmeric and rub with the head. 4. Heat a deep pan on medium high and take 2 tablespoon oil. Fry the head each side. Take out the head and add rest of oil in same pan. 5. Fry onion until it becomes soft. Add ginger paste, garlic paste, chilli powder, turmeric, coriander powder, chopped garlic and bay leaves. 6. Fry spices until oil comes out. Add 2 tablespoon water and cook 2 minutes. 7. Add the lentil. Fry 3 minutes and add 6 cups of water and salt. 8. Bring to boil and add the head and green chillies. Simmer on low heat till lentil is cooked. 9. Add fried cumin and coriander leaves. Serve hot. apu thanks for the recipe. is it a good idea to break down the whole head ?